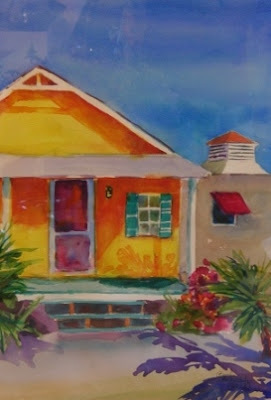 Brenda Bickerstaff-Stanley, "Bright Sunlit Cottage"
During morning meeting today, I surveyed the audience at one point, and I must admit to being surprised that a large percentage of the students were looking directly at the speaker. I'm afraid I've often assumed a negative mindset about student attentiveness, taking it for granted that most of the kids are not particularly attentive during large meetings. So I was a bit startled this morning to see nearly the entire middle school with faces alertly forward. I need to remember this when I get into one of my pessimistic attitudes about kids' ability to attend. They actually do it amazingly well, probably better than many adults.